If you're just getting started with syncing to Pipedrive check out our article on how to connect to Pipedrive here. The Email Detail option allows you to choose if you would like to include the entire email in each activity on your activity stream, or just a link to the email. You can also choose to only sync the first instance of each activity for a message. You can specify email domains and email addresses to exclude from being logged in your CRM. You may want to exclude your company's email domain, to avoid logging internal emails to Pipedrive. Or you may want to exclude the email addresses of friends who you email from your work account. Go to your Mixmax CRM settings and add email addresses or domains to the corresponding field. Organization Admins can set exclusions for each role in the organization. To do this, use the exclusions tab in the role you want to apply the exclusion to. You can learn more about roles in our help article: Account & Billing Overview. If there is no record associated with that email address, you can create a record. 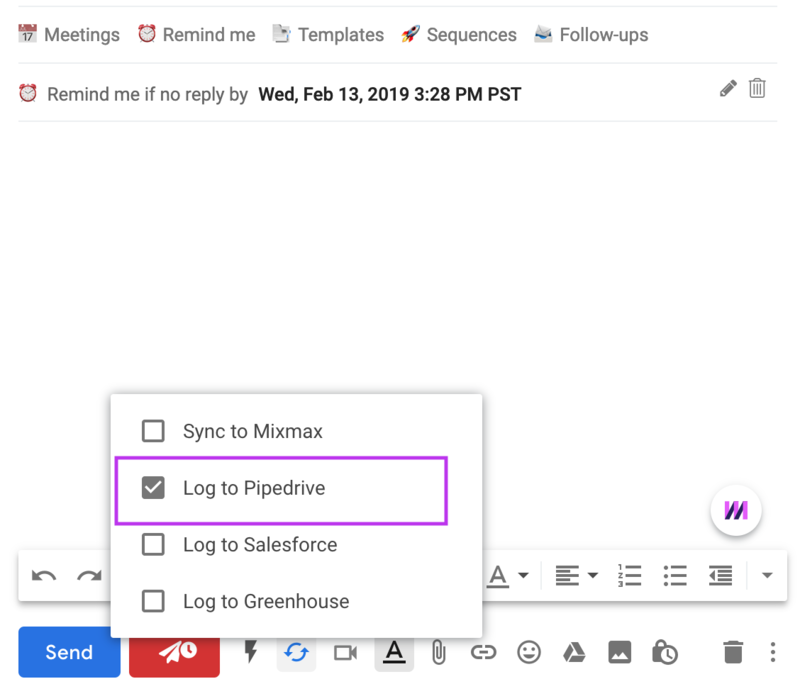 If you're viewing an email from a person for whom you have a record in Pipedrive, you can see and edit their records in the sidebar. If you are viewing an email with multiple recipients, you can see the Pipedrive record for each person in the conversation by clicking each email address. 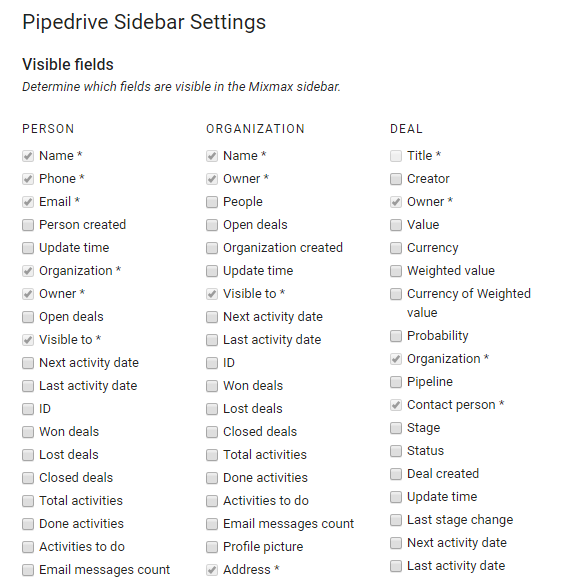 You can adjust which fields appear in the Pipedrive sidebar from your CRM settings in Mixmax. Just place a check-mark next to the fields you would like visible. Fields that are set as required by your Pipedrive admin will always be visible. 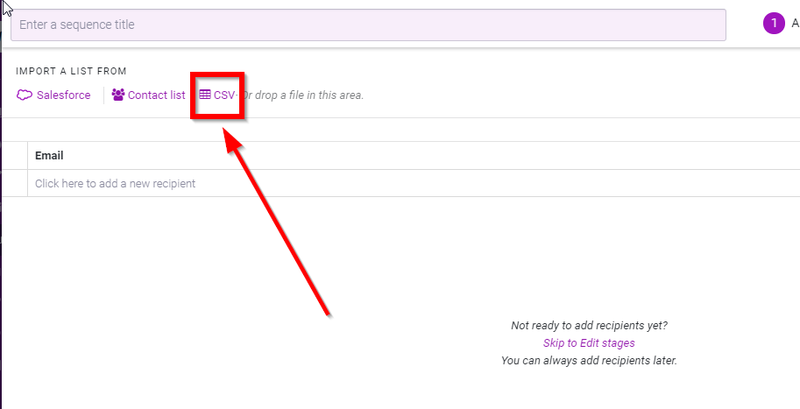 To add a Pipedrive list to Sequences, first export your list to a CSV file using the steps here. You can then import the CSV into a sequence using the CSV button on the recipients table. A way to import your data directly into sequences is on our roadmap - Stay tuned! 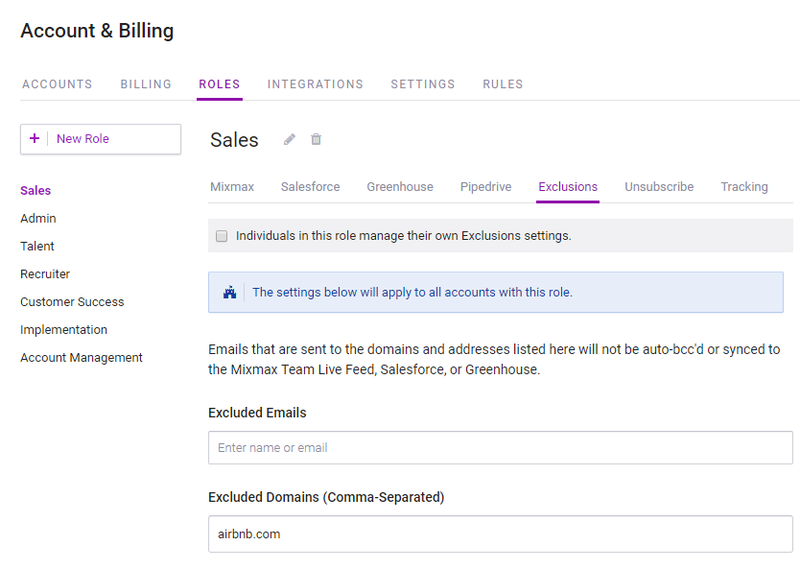 On the Mixmax Enterprise plan, you can automate your workflow with Pipedrive Rules.